We loved going to See’s Candy while growing up. It was so fun looking at all of the delicious candy through the counter window. You could always count on them to give you a free chocolate for coming into their store. Polar Bear Paws were a family favorite! We saw these on Pinterest from Garnish and Glaze and have been so excited to make them. They taste like the real deal! Delicious caramel and peanuts coated with a vanilla chocolate coating. Mix sugar, corn syrup, butter, and 1 cup whipping cream in a 4 quart pan and bring to a boil over medium heat. Stir constantly. Continue stirring and it will begin to thicken and darken in color. Cook until it reaches about 242 degrees (soft ball stage). You can do the cold water test by spooning a little of the caramel into cold water, let it sit for a few seconds and then pull it out and if it can hold the shape of a ball then it's done. If not, keep cooking and repeat the test. (This cooking process to get it to the right temperature could take up to 20 - 25 minutes. Just keep stirring over the medium heat). When it reaches the soft ball stage or 242 degrees, remove from heat and stir in vanilla. Then fold in the peanuts. Pour into a bowl to cool for about 30 minutes, stirring every few minutes to cool quicker. Spoon onto parchment paper in tablespoon size mounds. Place in the fridge for about 30 minutes until set. 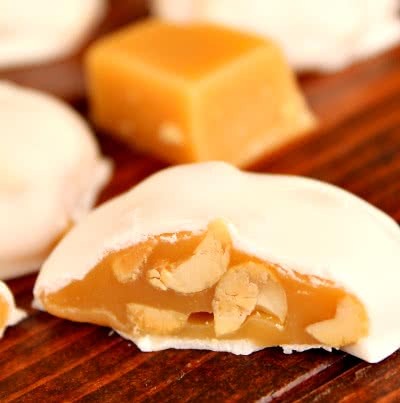 Melt vanilla candy coating in the microwave on low for 30 second increments. Stir until melted and smooth. Dip the caramel cluster into the white chocolate with a fork allowing the excess chocolate to drip off. (I use a plastic fork with the middle tines broken out.This works great for letting the excess chocolate to drip back into the bowl) Place back onto the parchment lined pan to set up. They can be refrigerated to set up faster. They have delicious candies!!! We'll be looking!